Shaak Ti was a female Togruta Jedi Master, hailing from the planet Shili, serving the Galactic Republic as a member of the Jedi Order in the final decades of the Republic Classic era. Joining the Jedi High Council in the years before the Clone Wars, she took up the ranks of General within the Grand Army of the Republic and was tasked with the oversight of clone trooper training on the ocean world Kamino. Floor-lenth circle skirt in Brown-red/rust red color, with a train that drags on the back. Fabric must be either finely sunray pleated, or a crinkle fabric to resemble the fine pleats of original. Long sleeved dark brown top with lower-cut neckline. Golden-brown thin neck scarf made from highly textured square, waffle like fabric (piqué). The scarf extends down to about knee-length and is about 10 cm wide. Wide Brown belt (~3” / ~7 cm) with a big bronze rectangle buckle. The buckle is ~ 2/3 width of the tabard and full high of the belt. One wide, leather or leather like, central calf-length tabard with accurate pattern in shades of brown as seen in the reference pictures. Should be hand tooled if leather or appear tooled if a synthetic is used. Paint may be used to add shading. Torgruta montral, with two uprised horns that curl slightly at the tips and are as tall as costumer’s face. The two front montrals hang to about mid thigh or around 10 inches from costumer’s natural waist. A third montral hangs down just past the waist and is twice as thick as the two front. Montral are off-white base color with gray-blue bands as seen in reference pictures. The white markings on the face is framed by a set of metallic silver teeth connected to each other with small metal loops. There should be about seven teeth down each side with a center tooth in the middle of the top forehead. Two thin metal chains with pearls are attached to the top of the center tooth and run back over the head between the montrals as a counter weight. From the loops on each side of the center tooth two small metal chains run down to a small oval silver medallion with a light greenish-yellow stone in the middle. The oval has medium sized white pearls on either side and on the bottom. A short center chain hangs down with a medium sized pearl at the end. From the other two lower pearls the chains continue down along the white markings and follow the face markings around to the each of the lower teeth on either side. There are small pearls at the smallest point of the nose between the eyebrows and higher up roughly halfway between the nose pearls and the medallion. Orange-red, evenly applied makeup on face and back of hands. Two white ovals encircle the eyes from forehead to cheeks leaving a orange-red outline at the montral, center of the forehead and sides of the face. Nails must be painted white with a black stripe. 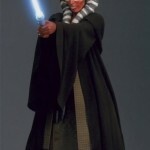 Dark brown Jedi robe with wide sleeves as long as costumer’s fingertips that are gathered at the wrist creating an asymmetrical hem where fabric is shortest at the wrists and longer in the back of the sleeves. Hem of robe is shorter in the front ending about shin length and has a train in the back. Robe train is shorter than the skirt train. The hood should be full enough that it extends past the shoulders when raised (montral off) and when down hangs past the shoulders. Lightsaber (No toy sabers, no Ultimate FX short saber). If bladed, blade is blue. Dark brown, closed-toed boots or shoes with a low heal. Footwear is barely seen as skirt touches the ground.